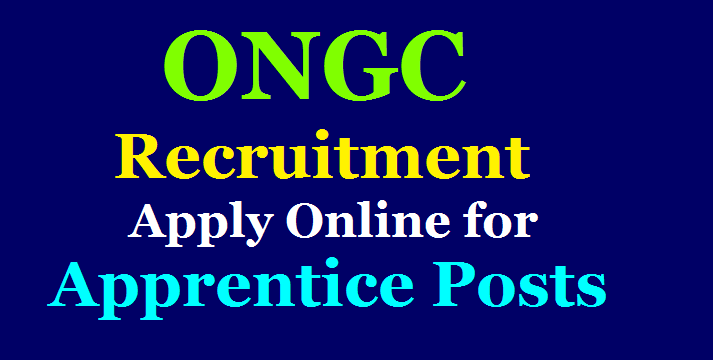 ONGC Recruitment 2019: Apply for 4014 Apprentices Posts at ongcapprentices.co.in Get details and Online Applications here: ONGC Apprentices Posts Recruitment 2019: Apply Online for 4014 Apprentices Posts via ongcapprentices.co.in. Oil and Natural Gas Corporation Limited, ONGC has invited candidates for the post of Apprentices. Interested candidates can apply for the post through the official site at ongcapprentices.co.in. Candidates can apply till the last date of receipt of application i.e., on March 28, 2019. A total of 4014 posts of Apprentices will be filled up through this recruitment drive. Candidates who want to apply for Apprentice posts need to have ITI certificate in the required discipline for applying for the post. The other information-important dates, selection process and vacancy details are given in this page. ‘Maharatna’ Central Public Sector Enterprise engaged in Exploration and Production of Oil & Gas in India and abroad, as a measure of Skill Building initiative for the Nation, proposes to engage apprentices at its location across 22 work centres. Accountant: Bachelors degree (Graduation) in Commerce from a Govt. recognized institute/ University. Assistant-Human Resource: Bachelors degree (Graduation) in B.A. or B.B.A from a Govt. recognized institute/ University. Secretarial Assistant: ITI in Secretarial Assistant trade. Computer Operator and Programming Assistant (COPA): ITI in COPA Trade. Draughtsman (Civil): ITI in Draughtsman (Civil) Trade. Electrician: ITI in Electrician Trade. Electronics Mechanic: ITI in Electronics Mechanic. Instrument Mechanic: ITI in Instrument Mechanic. Information & Communication Technology System Maintenance: ITI in Information & Communication Technology System Maintenance. Laboratory Assistant (Chemical Plant): B.Sc with PCM or PCB. ITI in Lab. Asst (Chemical Plant) trade. Machinist: ITI in Machinist Trade. Mechanic (Motor Vehicle): ITI in Mechanic Motor Vehicle trade. Mechanic Diesel: ITI in Mechanic Diesel trade. Refrigeration and Air Conditioning Mechanic: ITI in Refrigeration and Air Conditioning Mechanic trade. Surveyor: ITI in Surveyor Trade. Welder: ITI passed out in the trade of Welder (Gas & Electric). Civil, Computer Science, Electrical, Electronics, Mechanical: Diploma in the respective disciplines of Engineering. Age Limit: Candidates should be between 18 to 24 years of age. Candidates can apply for the post through the official link given above. The duration of the training is for 12 months for all disciplines. The registration process has two steps- Part I and Part II. Apart from the above link, candidates can also check ongcindia.com to apply for the same and for other related details. Oil & Natural Gas Corporation Limited (ONGC) invites applications for the recruitment of Assistant Technician, Technical Assistant, Security Supervisor & Other vacancies. Those Candidates who are interested in the vacancy details & completed all eligibility criteria can read the Notification & Apply Online last date March 28, 2019 .